An outstanding opportunity to purchase this Grade ll listed character property situated within this Elmhirst Farm development. A beautifully appointed and remodelled 3 double bedroom converted barn featuring a wealth of charm and character as well as high appointed fixture and finish throughout. An outstanding opportunity to purchase this Grade ll listed character property situated within this Elmhirst Farm development is this beautifully appointed and remodeled 3 double bedroom converted barn featuring a wealth of charm and character as well as high appointed fixture and finish throughout. The property retains many original features such as exposed beams and stonework and features a bespoke fitted kitchen and bathrooms. The property is situated on the outskirts of Cawthorne towards Howlandswaine and features a south facing rear garden, being a natural suntrap. The property is set within close proximity to highly regarded local schools, local amenities and transport links to neighbouring towns and cities. ENTRANCE HALL Entering the property from the south elevation via hardwood French double glazed doors into the principal reception room/lounge. LOUNGE 19' 4" x 16' 1" (5.89m x 4.9m) An outstanding room presented to the south elevation of the property having a large picture window with outstanding panoramic views across open countryside and surrounding areas. There is a secondary side double glazed window providing light within, a vaulted ceiling with an exposed king post truss and a focal point bespoke fireplace at an elevated position with slate hearth and multi fuel burner set above. There is also a log store beneath, a laminate finish to the floor, a radiator and a beamed archway gives access into the living kitchen. KITCHEN 19' 0" x 15' 10" (5.79m x 4.83m) Measuring the full depth of the property featuring a bespoke fitted kitchen with wall and base units in shaker style in an alabaster finish with antique fitments and a solid oak work surface with complementary upstands incorporating a granite sink unit with mixer tap over. There is an overhanging space with seating for up to four persons. There are fully integrated Neff appliances including an integrated oven, a microwave oven, fridge freezer and a five ring induction hob. There is a fitted dishwasher and a washer/dryer There is full laminate finish to the floor, a bespoke seating and storage area with window seat, a radiator, two hardwood double glazed windows providing light within as well as a hardwood door giving access to the side elevation. There is inset spotlighting and bespoke drop lights. This provides access to the inner hallway of the property. INNER HALLWAY Providing access to 2 bedrooms and family bathroom. There is inset spotlighting and a radiator. Access to the rear hallway/office area where a staircase elevates to the first floor landing. MASTER BEDROOM ONE 15' 5" x 10' 8" (4.7m x 3.25m) A spacious master room presented with to the side elevation having a hardwood double glazed window, a radiator and a range of semi-fitted wardrobe furniture to one wall providing extensive storage. 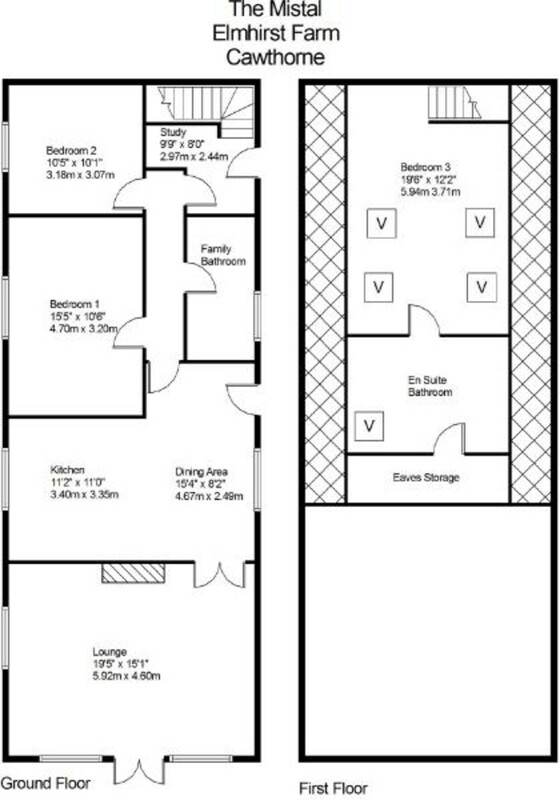 BEDROOM TWO 10' 10" x 10' 1" (3.3m x 3.07m) A side facing double room having a hardwood double glazed window and a radiator. REAR HALLWAY Having a timber double glazed door opening out onto the rear parking area. This could be used as a home office, study or playroom. There is a staircase rising to the first floor landing where there is a secondary double glazed window providing light within. FI RST FLOOR BEDROOM THREE 12' 1" x 23' 6" (3.68m x 7.16m) An outstanding room at first floor level having four Velux windows with integrated blinds providing outstanding aspect outlooks over Hoylandswaine and surrounding areas. There is a radiator, under eaves storage and spotlighting to the ceiling. Access to the en suite bathroom. ENSUITE BATHROOM The bathroom feature a three piece Victorian style suite comprising of a low flush W.C., a pedestal wash hand basin and a freestanding cast iron foot bath with central telephone tap. There is inset spotlighting, a radiator, under eaves storage and a Velux window with an integrated blind. There is vinyl finish to the floor, an extractor fan and a door provides access to the attic storage area which houses the combination boiler. EXTERNALLY Approached off South Lane onto the Elmhirst Farm development. There is a tarmac sweeping driveway providing access to a detached double garage with electrically operated doors and electric and lighting within and there are 2 parking spaces directly in front of the garage. Directly behind the garage are stone steps leading up to an elevated south facing garden which is a natural suntrap and provides access to the property. There are large paved seating areas with lawned gardens sweeping round to the side elevation where there are further seating areas. The plot is stone wall and fence enclosed. SERVICES Mains electricity. Mains water. LPG gas. drainage via a septic tank. These details were prepared from an inspection of the property and information provided by the vendor on 3rd April 2019.